The Sublime Degree of Master Mason is often thought of as the ultimate degree of Freemasonry. However, many Masonic scholars agree that the narrative of the Craft, as illustrated in the three degrees, is not the whole story. The Degrees of York Rite Masonry complete the story and provide answers to many questions that the newly-raised Master Mason may have. The York Rite is one of the appendant bodies of Freemasonry. York Rite Masonry, which takes its name from the old English city of York, dates back 1744 in the U.K., has been described as the oldest and purest of the Rites. Like other forms of Masonry, the York Rite is not a religion. Nevertheless, it does develop Biblical themes in addition to themes based on the Medieval Crusades. In the York Rite, A Master Mason may become a member of three bodies — actually a group of separate Rites joined in order. 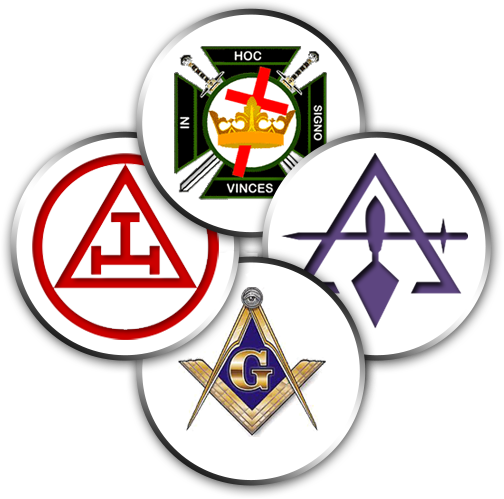 These include: a Chapter of Royal Arch Masons; a Council of Royal and Select Masters; a Commandery of Knights Templar. -The Mark Master Mason degree, which is sometimes said to be expansion of the Fellow Crafts’ second degree. -The Most Excellent Master degree, wherein the building of King Solomon’s Temple has been completed. -The Royal Arch Mason degree, said by many to be the most beautiful degree in all of Freemasonry. By joining the York Rite, a Master Mason may proceed to supplement and expand upon the degrees of the Blue Lodge. The symbolism of the Royal Arch picks up where the Symbolic Lodge leaves off. The symbolism of the Blue Lodge degrees emphasizes the building of King Solomon’s. Royal Arch Masonry (known as Capitular Masonry) continues in this vein by emphasizing symbols and allegories of the Second Temple, the Ark of the Covenant, further symbolism of Solomon’s temple completed, and the Lost Word (also called the Master’s Word) — which is given to the Royal Arch Mason. Within York Rite Masonry, the Royal Arch Degree is described as the Master Mason’s Degree completed. This is due to the fact that up until 1767, the Master Mason Degree of the Blue Lodge contained the secrets of the Royal Arch. Nowadays, these same secrets form a part of the teachings of the Royal Arch. In England, the Royal Arch Mason degree is automatically included in the Master Mason’s Degree. In 1813, the Mother Grand Lodge of England stated it in no uncertain terms: “Ancient Craft Masonry consists of three degrees and no more, namely, those of the Entered Apprentice, Fellow Craft and Master Mason including the Holy Royal Arch.” It is a natural progression of the Freemasonry’s primary theme. No other degree has been officially recognized by the Mother Grand Lodge — this landmark remains to this day. No additional Rites and Degrees can be bestowed upon a Master Mason until he has received the Royal Arch Degree. This is perfectly logical, because a man is not a Master Mason until he receives the Master’s Word. This is something a Mason can only receive in the Royal Arch. Within Capitular Masonry are contained the essentials of symbolism, allegory, and philosophy that a Master Mason requires in order to understand those teachings which have only been partially given to him in the Blue Lodge. In architectural symbolism, the capstone is the crowing stone of an entire structure or wall. It is for this reason that Royal Arch Masonry is called “the Capstone of Ancient Craft Masonry” or the Capitular Rite. After the degrees of Royal Arch Masonry, the second set of degrees within York Rite Masonry encompasses the degrees of the Council of Royal and Select Masters. These degrees expound upon the Royal Arch degree and, to a lesser extent, the Master Mason degree. They are often said to be among Masonry’s most beautiful and impressive ceremonies, complete one’s education in Ancient Craft Masonry. The degrees of the Council comprise what is called Cryptic Masonry or the Cryptic Rite because a crypt or underground room figures prominently in the degrees. The symbolic foundation of these rites is the subterranean Vault constructed by King Solomon as a stockpile for certain secret knowledge which was guarded by a select priesthood. -The Royal Master degree examines in more detail the story of recovery of the “lost” word and the Holy of Holies of the Temple of King Solomon. -The Select Master degree is concerned with the construction and embellishment of the subterranean vault introduced in the Royal Arch degree of the Chapter. -The Super Excellent Master degree concerns the story of the Babylonian Captivity, and of Zedekiah and his betrayal. Through these ceremonies, a Mason learns more details concerning the building of the first temple. He discovers why the word was lost, and the secret of its preservation and recovery. The completion of the York Rite Bodies is the Commandery of Knights Templar—the degrees of which comprise what is known as Chivalric Masonry because they are based upon the Chivalric Orders of knighthood that fought to protect Christian pilgrims in the Holy Land during the Middle Ages. Unlike other Masonic bodies which only require a belief in a Supreme Being regardless of religion, membership in Knights Templar is open only to Royal Arch Masons who promise to defend the Christian faith. Despite the name, the Masonic Knights Templar is not considered to be any kind of lineal descendant from those historical orders of knighthood. -The Illustrious Order of the Red Cross illustrates the preparations for building a second Temple. -The Order of the Knights of Malta (or simply Order of Malta) explains the history of the Knights of Malta, relates the story of Paul’s arrival on the island of Malta. It is a Christian Order that seeks to perpetuate ideals of love and mercy. -The Order of the Temple. The Order of Malta and the Order of the Temple have a Christian orientation and their teachings are based upon the crusades of the original Knights Templar. The Knights Templar is based upon the practice of the Christian virtues, moral values and spiritual lessons. Members are urged to live their lives as Christian Knights. The rich history of York Rite Masonry is undeniable. The York Rite is historically the oldest and purest of the appendant Rites. Every Master Mason should be fascinated by the lessons and mysteries of Freemasonry provided by the Blue Lodge. Hopefully, all Master Masons will consider those lessons and mysteries available in the York Rite of Freemasonry — in order to complete their Masonic knowledge and the teachings that are mentioned as landmarks of the Master Mason. All brother Masons should be advised to continue their historical and educational view of Masonry. Every Master Mason should be a member of the Royal Arch, and every Christian Mason should be a Knights Templar.